Over the last several years, Grace Communion International (GCI) has travelled a journey of reformation that has led us to embrace a biblically-based theology that is Christ-centered, incarnational and trinitarian (in this blog we refer to it as trinitarian theology). With this post, GCI launches this blog as a place to discuss how this theology undergirds and shapes the worship ministries of the church - thus this blog's name is trinitarian worship. My name is Mike Hale (fifth from left in the picture of Higher Ground, the worship band of which I am a part). I will be serving as the primary moderator for this blog, working in conjuction with others in GCI-USA ministry development. I invite your participation in this discussion as we seek to follow the Spirit in our continuing journey. Our discussion will be of particular interest to worship directors, pastors, worship leaders, musicians, technicians, small group leaders, etc. Note instructions posted in the right-hand column of the main page concerning how to send in new posts and comment on existing posts. I hope to hear from you. Now let me share some details of my personal journey and some concepts about trinitarian worship to jump-start our discussion. GCI's journey of reformation began in 1995-96, with massive doctrinal changes that spawned many changes in the denomination's practices. One such change involved moving from song-leading in what we called church services, to worship-leading in what we now view as worship services. As I had been a church soloist for many years and also a lead singer with several pop bands, I was commissioned to serve as a worship leader in our denomination's headquarters congregation, and also to help launch an alternative evening worship service using praise bands. I was lead singer for the praise band Higher Ground, and we were asked to lead worship at several church festivals. Additionally I was asked to help launch a mid-week employee chapel service. Before long I was also asked to lead worship at an evening prayer and praise service for a small mainline church plant. While I was excited about these ministry opportunities, the challenges were daunting - in part because while the switch from song leading to worship leading sounds simple, it was a more significant change than I first imagined. For one thing, we had made the switch from primarily singing songs that were about God, and had begun singing more “vertical” worship songs that were both intimate and prayerful. I welcomed that change, but it still had to be worked through with the congregations. Then there was the matter of our fellowship placing new emphasis on the Trinity. So besides wanting to find out all I could about leading worship, I also yearned for a better understanding of the nature of the Trinity and of our intimate relationship to the Father, Son and Holy Spirit, and the implications for worship. I began by reading a tall stack of books on worship (a really tall stack) and began attending worship conferences, seminars, and worship workshops. I sought out magazine articles about worship, watched instructional videos and listened to instructional tapes and CDs, and visited churches in the area known for outstanding worship programs. But while all this was helpful to some degree, I had encountered a dizzying array of different and sometimes contradictory approaches to worship, and there was far less consensus than I imagined there might be. Some authors and speakers concentrated on musicianship, smoothly managed transitions and better equipment. Some focused on liturgies or traditions. Some had views on “authentic” worship or “appropriate” worship or “empowered” worship. Many were locked in discussions (and arguments) about trends, music styles and cultures. Others presented sets of scriptures “proving” their own particular Biblical views of worship. It was my sense, however, that something was missing - something that spoke more to the core issue of the nature of God, and what God is doing in worship, and how we each individually and collectively as the people of God fit into that dynamic and relationship. Not having the answers, I soldiered on, yet still yearning for better understanding. Then in 1997 Dr. John McKenna was brought in as a doctrinal advisor to our fellowship. Having been mentored by Thomas F. Torrance, Dr. McKenna brought with him a rich and rare understanding of Christ-centered, trinitarian theology (of course I knew nothing of this at the time, and didn’t know Torrance from Adam). One day I struck up a conversation with Dr. McKenna, and eventually described my worship leader predicament to him. At the same time I mentioned that some of us were beginning to experience the touch of God during worship, but that while such experiences were indeed encouraging, I was somewhat at a loss to explain what was happening. Dr. McKenna suggested that I begin reading the theology of T.F. Torrance, and he recommended Royal Priesthood: A Theology of Ordained Ministry, and The Mediation of Christ. Soon I also read Worship, Community and the Triune God of Grace, by James B. Torrance, the brother of T.F. For me, the introduction to this theology was a Godsend. Instead of studying worship as a separate and compartmentalized matter, a far better starting place was Torrance’s holistic Christ-centered, trinitarian approach that provides an in-depth discussion of Jesus as the Revelation of God, and the Church’s relationship to Divine Reality. Worship is a gift (of grace) of participating through the Spirit in the incarnate Son’s communion with the Father. The bodily-risen Son of God/Son of Man is our Mediator – as God’s Word to us and our word to God in one person. This was all somewhat overwhelming at first, but by the grace of God my eyes were gradually being opened, and there was a real sense of joy and freedom in reflecting on Torrance’s descriptions of Divine Light and Life, rather than my focusing on the surface-level issues contained in most books on the subject of worship. I was hooked, and through the years have continued reading books by Torrance or by students of Torrance, and Dr. McKenna has been gracious in meeting with me to discuss what was being read. Like we all are, I’m a work in progress, but there has been much joy in the journey for this worship leader. While Royal Priesthood was my starting place, it is not one of the better known books by Torrance, and there are probably better places to start, such as with Alister McGrath’s T.F. Torrance, An Intellectual Biography, Elmer Colyer’s How to Read T.F. Torrance, or A Passion For Christ: The Vision That Ignites Ministry, essays by T.F. Torrance and his brothers James and David, edited by Gerrit Dawson and Jock Stein. More comprehensive (and extremely readable) is the 2008 release, Incarnation: The Person and Life of Christ, edited by Robert T. Walker. The pattern for the Church’s worship and its relation to the heavenly worship is to be discerned in the Suffering Servant (Jas. 5:10). The way in which the Church draws near to God is the way of the Son of Man . . . we may observe that while the New Testament uses priestly language to speak of the Royal Priesthood of Christ in His Word and Action, it also applies priestly language to the Church, showing that the Church is given to participate in His ministry, in word, deed, and life; in word, by proclaiming the Gospel to the nations, and deed, by self-sacrifice, by ministering humbly to the needs of others, and by presenting our bodies in worship to God. In this unity of word and deed, of worship and mission, in the life of the Church as the Israel of God under the rubric of the Suffering Servant, we have the fulfillment of what the prophets of the Old Testament saw from afar. The Word must be done into the flesh, the priestly liturgy must be enacted in life and obedience...described as circumcision of the heart... Likewise the Christian liturgy, the Church’s priestly ministry, divorced from the life of the whole Body, is ‘of the flesh’. Christian liturgy and priesthood derives from the Suffering Servant and is to be enacted in the Body. That is our rational worship. Good to see this blog, Mike! I am one of several worship leaders in my congregation - we rotate through the months - so this will be of interest to us all...I'll tell them about your blog. I loved your sentence that worship is all about participating through the Spirit in the communion of the Son with the Father - that's SO MUCH better than "song leading" (which I did for years pre-95). I long for our people to experience that... One thing I've mentioned to others is that to lead worship, one must worship! Talent and technical expertise is one thing, but heart is above all in importance, I believe. I love it when I actually worship while leading worship - not just thinking of the next song or transition. I recently read an article in ChristianityToday that said worship should "fit the contours of the Gospel." Wow! That is something I shared with my co-worship leaders and hope it is something we can all think about. All the best in your endeavors here! Ted, you bring up important points, and no doubt we will often discuss the matter of worship in small congregations. 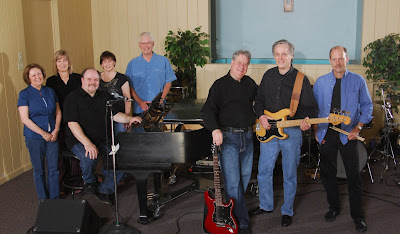 In fact I considered not using the picture of our praise band Higher Ground on the inaugural post, since many congregations simply do not have the resources for a full praise band. I certainly don't mean to imply that the blog will primarily be about music or praise bands, or that every congregation should make it a goal to have a band. I do think it is unnecessary for small congregations to try to model their worship services after those of mega churches having huge worship departments and multiple teams of singers and bands. And no matter what size of church, no person or group of people is the same, and since God is closer to each one or us than we are to ourselves, what the creative Spirit is doing in and with one person or group will not be the same as what he is doing in and with another. There is certainly much to share, and I look forward to hearing from others about additional topic ideas.